My husband is a vitamin and supplement firm believer. It made me take a closer look, the man is less sick than I am. Could it be genetics or is it the supplements? Maybe both? I began taking and have been doing better myself. What's your thought on supplements? 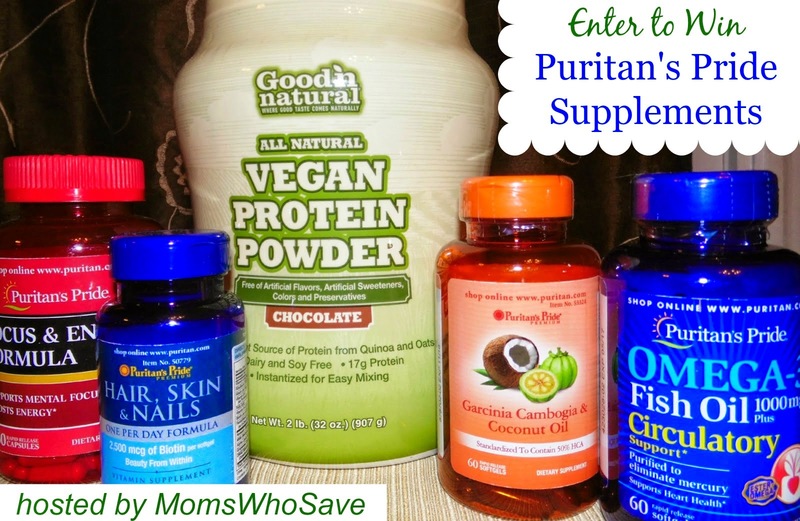 Now here is my fellow blogger's take on the Supplements she reviewed and sharing this fantastic giveaway. Have you made a resolution to get healthier this year? If you're ready to make some positive changes, now might be the time for some new products that can give you just the right boost for the year ahead. Let me tell you a little about some supplements from Puritan's Pride you might want to try. Of course, before taking any supplements, check with your personal physician. The Hair, Skin & Nails One Per Day Formula contains biotin. Biotin plays a key role in the body. It supports the health of the skin, hair, nails and energy metabolism. * As biotin is not stored in the body, it is important to consume adequate amounts each day. Biotin occurs naturally in many foods. Wheat germ, whole wheat bread, egg yolks, dairy products, nuts, Swiss chard, salmon, and chicken are all sources of biotin. All Natural Vegan Protein Chocolate with Quinoa and Oats: This innovative formula has been designed to eliminate all animal and animal by-products. Each serving provides nutrients derived from Quinoa and Oats which makes it a great clean and nutrient-dense source to help fuel your body, aid in post workout recovery or help satisfy hunger. This alternative protein is also great for those looking to avoid artificial ingredients including preservatives, colors, flavors and sweeteners. Athletes, bodybuilders and everyday active adults can attain benefits by incorporating this protein rich powder into their diet and exercise program. If you need a burst of energy to get you going through your day, all you need is one capsule and you’ll be ready to go! * Contains bioactive compounds for dieting support so you can get into excellent shape while keeping your energy levels maximized. * Use in conjunction with an intense daily exercise program and a balanced diet including an adequate caloric intake. When it comes to supplements that I take, or those I give to my family, I don't trust just any brand, and neither should you. I always do my research, especially with anything concerning my family's health. You'll be happy to know that Puritan’s Pride® began over 40 years ago with one mission--to make the finest quality nutritional supplements available at the best value. The company remains true to its original commitment and now serves millions of loyal customers. Puritan’s Pride manufactures thousands of vitamins, minerals, herbs, and other nutritional supplements in their state-of-the art facilities throughout the U.S.
To get your new year off to a healthy start, you have the chance to win a prize pack of Puritan’s Pride® products. You'll get everything you see pictured above. If you'd like to win, just enter on the easy Giveaway Tools form below. *New entry options added! Good luck everyone! Prize will be provided by the sponsor. Please see giveaway terms and conditions on the Giveaway Tools form. I'd like to try their Stevia products. I'd like to try the Beauty Box Kit. Steve Madden, Kate Spade bags & sunglasses, DC for adults & kids, Laundry by Shelli Segal, & LOTS more now on Zulily!